As far back as I can remember music has been a very intricate part of the community. We all sang songs whether we had good voices or off-key voices. Many had special musical talents and could play musical instruments; some by ear and some by taking lessons. We had lots of dances both ballroom and barn or called dances. The first dances that I went to were children dances (ballroom) for children of Primary age up to 12 years of age. These dances were held in the basement part of the old sandstone church. There were enough people here then that the dance hall was too small to accommodate everyone, so they split the age groups. They even appointed men to be dance floor managers. I remember George Paskett and Clarence Richins as floor managers during my late Primary days. We tried to dance with the adults but the floor managers always escorted us off the dance floor. We could watch but not dance. We grew up learning to dance with partners. We not only learned ballroom dancing we learned to do called, reel, and barn dancing. We had dances for every holiday, one the evening before and one on the holiday. We even had dances at school in what we called the vacant room. Eve Betteridge played the piano, Lyman Kimber his guitar, and Ronald Ballingham on the harmonica. Many interesting things happened at these dances. Some families always brought their children with them to the dances. They made beds for them behind the curtains on the stage where extra benches were stored. WeIlie and Ruby Richins forgot to pick up their baby boy. They remembered when they were home and had to get the janitor to let them back in the building to get him. I think it was Virgil Richins. We children liked to go back to the building after a dance. We could always find nickels, dimes, or quarter that fell out of pockets under the benches or around the building. Even a penny could buy a piece of candy at Mide’s store. For many of the dances, people would decorate the hall with crepe paper making the hall more festive. Sometimes the violin player would use his bow to bring some of the streamers of crepe paper down, and he and the saxophone player danced as they played. We young people thought they were pretty funny. We always had a live orchestra to play for our dances. In the early days, I remember Mide Wakefield, and Val Tanner played mouth organs and Orita Lee corded on the piano when an orchestra wasn’t available. In the 1920’s Aunt Bertha McCustion Kimber came from the Kimber Ranch to, play the piano for dances. Sometimes an orchestra from out-of-town was hired to come in and play for special occasion dances. I remember Mr. Lee Martin from Montello, Nevada came with one of the orchestras. He was very talented. We always had our own Grouse Creek Orchestra to rely on. The first one that I remember was Pearl Douglas Harris piano; Mark Warburton, violin; Karl Warburton, saxophone; and I can’t remember who played the drum. 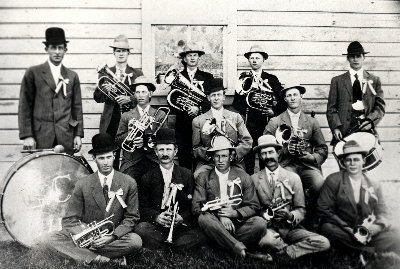 Later another group became the Grouse Creek Orchestra; Raida Kimber, piano; Ivan Kimber, alto saxophone; Grant Kimber, B flat saxophone; Archie Toyn B flat saxophone; Lyman Kimber, violin-guitar-banjo-drum; and Naomi Kimber as relief player on the piano. Many times Raida and the group played for very little money and several times they donated their time to help the ward. They became well known throughout our area. People liked the music, rhythm and style. They played in various areas including Oakley Idaho Stake; Almo, Idaho; Malta, Idaho; Montello, Nevada; Wendover, Nevada; Yost, Utah; Park Valley, Utah; Snowville, Utah; and Standrod, Utah. There was an early band of musicians, but I don’t remember the band. I do remember some old musical instruments; mostly types of horns and a big drum that was stored in a small room under the stairs in the basement of the old sandstone chapel. If I remember correctly Flora Tanner and I went snooping around after we heard they were there and blew a couple and pounded on the drum. I heard that several of the boys tried them out, too. I don’t remember what happened to them. They weren’t there when we tried to play on them again. In the early days they danced to mouth organ music. Those who could play them were Milas Wakefield, George Ballingham, Clarence Richins, Val Tanner, Lyman Kimber, and Ronald Ballingham. We have always had someone to play the piano or organ for our church meetings. Those of earlier days which I remember were Orita Richins Lee, Leone Wakefield Carson, Raida Betteridge Kimber, and Lyman Kimber. Now, we rely on Elizabeth Kimber, Debbie Kimber Evans, Julie Tanner, and sometimes on visitors Karla Kimber Beecher, and Mary Ann Clayton- Branch Missionary. We have some talented young people today that have taken lessons on the piano: Abi Tanner, Heston Warr, Alex Tanner, and Kyle Tanner. In the earlier years most of the people played by ear. By ear, I mean they listen and hear the music and can play it on their instrument. Some taught themselves with books of instruction and some by teachers of the instrument. Some of those who could play by ear were: Leon Wakefield Carson, Raida Betteridge Kimber, Archie Toyn, Lyman Kimber, Dorothy Kimber Covieo, Delma Kimber Smith, Eva Betteridge Rowley, Claude Wakefield, and probably others that I’m not aware of. Those that I know of who taught themselves with instruction books were: Ivan Kimber and Grant Kimber. Those who took lessons were Pearl Douglas Harris, Orita Richins Lee, Bertha McCuistion Kimber, LaVerne Barlow Frye, Naomi Davis Kimber, Elizabeth Kimber, and Julie Tanner. Grouse Creek has had people that sang very well. At one time we had a choir. William Paskett, Milas Wakefield, Don Wakefield, and Lyman Kimber led the choirs. Two groups were invited to sing outside of Grouse Creek. Don Wakefield and the choir were invited to sing at the North Weber Stake Priesthood Conference April 1934. They traveled by train over the old Lucin Cut-Off. People in North Weber Stake provided a place for them to stay while in Ogden. Lyman Kimber and the choir were invited to sing at the Cassia Idaho Stake Conference November 1953. They sang in the old rock chapel in Oakley, Idaho. Elder Mark E. Peterson was the speaking General Authority. The weather was good going but when they returned it had snowed about six inches of very wet snow on the mountain and they had difficulty getting over the mountain. They only had one pair of chains, so they put them on one car at a time, send them up, and take the chains back, then chain up another car. The process was repeated until all the cars made it over the top. Some of the women rode in the trunk to help give the car extra traction. Many of the young people played in the snow. 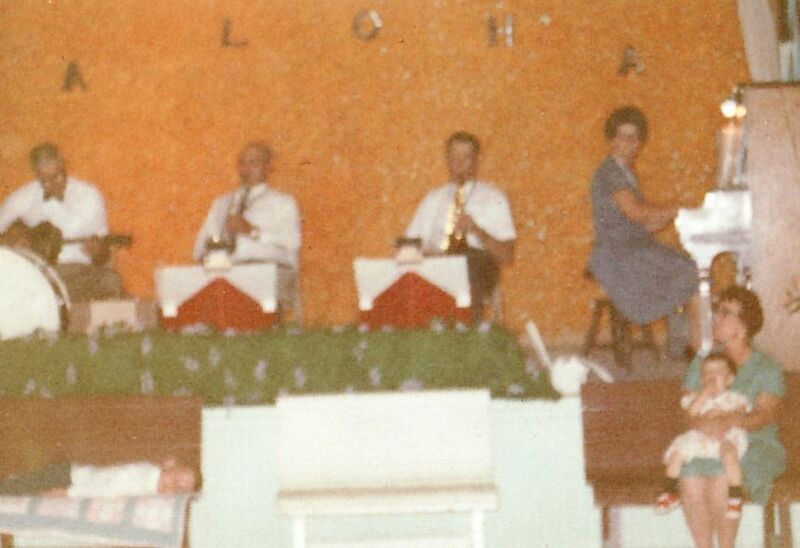 Grouse Creek has had many who were able to sing solos, trios, and quartets. I don’t remember all the older singers but I do remember Newell Richins, Don Wakefield, Lyman Kimber, and Monti Tanner singing solos. Those who sang together were Raida Betteridge Kimber and Naomi Davis Kimber, Raida and Lyman, and Diane McMullin Tanner and Julie Tanner. Recently Aron Warr has been singing solo in the Branch. Archie Toyn and Lyman Kimber sang together, too. Lyman and Raida probably have sung more funerals than anyone. I think Orita Richins Lee played the organ for the most funerals. 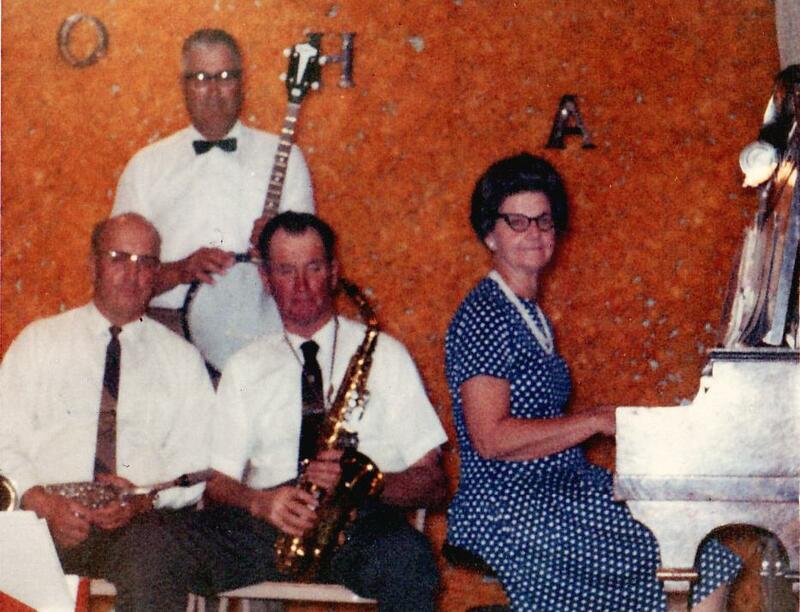 Archie and Lyman played instruments and led singing at many camp fire gatherings. All of Milas Wakefield’s family sang and played instruments. There were many who could play the piano or organ. Maybe I’ll leave some out, but I’ll try: Bertha M. Kimber, Orita Richins Lee, Pearl Douglas Harris, Ida Kimber Carter, Raida Betteridge Kimber, Eva Betteridge Rowley, Melba Ballingham, Murtrice Ballingham Philpott, Verda Ballingham, LaVerne Barlow Frye, Leone Wakefield Carson, Loretta Wakefield Smith, Dorothy Kimber Covieo, Delma Kimber Smith, Verna Kimber Richardson, Karla Kimber Beecher, Cora Toyn Lind, Mildred Toyn Ballingham, Archie Toyn, Lyman Kimber, Gail Toyn Wadman. Today: Julie Tanner, Diane Tanner, Abi Tanner, Alex Tanner, Kyle Tanner, Elizabeth Nye Kimber, Heston Warr and Debbie Kimber Evans. Those who played other instruments are: Milas Wakefield, Don Wakefield, Claude Wakefield, Elwood Wakefield, George Ballingham, Clarence Richins, Charles Toyn, Ronald Ballingham, Frank Paskett, James Cook, Alma Toyn, John Betteridge, David A. Toyn, Art Richins, Bill Betteridge, Steven Paskett, Ted Betteridge, Wilfred Richins, Newell Richins, Joseph Lee, Archie Toyn, Lyman Kimber, Karl Warburton, Mark Warburton, Ivan Kimber, Grant Kimber, Marlene Toyn, Arlene Wakefield Munns, Eula Kimber and probably many others. I’m grateful for the opportunity to be able to recall all those who have been able to share their musical talents in Grouse Creek.